A new strategy to improve the therapeutic utility of redirected T cells for cancer involves the development of novel Ag-specific chimeric receptors capable of stimulating optimal and sustained T cell antitumor activity in vivo. Given that T cells require both primary and costimulatory signals for optimal activation and that many tumors do not express critical costimulatory ligands, modified single-chain Ab receptors have been engineered to codeliver CD28 costimulation. In this study, we have compared the antitumor potency of primary T lymphocytes expressing carcinoembryonic Ag (CEA)-reactive chimeric receptors that incorporate either TCR-ζ or CD28/TCR-ζ signaling. Although both receptor-transduced T cell effector populations demonstrated cytolysis of CEA+ tumors in vitro, T cells expressing the single-chain variable fragment of Ig (scFv)-CD28-ζ chimera had a far greater capacity to control the growth of CEA+ xenogeneic and syngeneic colon carcinomas in vivo. The observed enhanced antitumor activity of T cells expressing the scFv-CD28-ζ receptor was critically dependent on perforin and the production of IFN-γ. Overall, this study has illustrated the ability of a chimeric scFv receptor capable of harnessing the signaling machinery of both TCR-ζ and CD28 to augment T cell immunity against tumors that have lost expression of both MHC/peptide and costimulatory ligands in vivo. T cell-mediated tumor immunity is often compromised against tumor cells, in that they largely express self-Ags or can down-regulate MHC molecules that present immunogenic peptides (1, 2). Cellular immunotherapies involving the infusion of autologous lymphokine-activated killer cells or tumor-infiltrating lymphocytes harboring antitumor reactivity have had limited efficacy in boosting antitumor immunity in patients with melanoma and renal cell carcinoma (3, 4). The broader application of this type of therapy has also been severely limited by toxicity associated with administration of IL-2 to sustain the cells in vivo. Other cancers such as breast and colon carcinomas have been totally refractive to these T cell-based therapies. To harness the full potency of the immune system, T cells have been genetically engrafted with specificity for a tumor-associated Ag through the expression of integral-membrane single-chain variable fragment of Ig (scFv)4 chimeric receptors (5, 6, 7). This approach can significantly enhance Ag-specific tumor immunity by increasing the number of tumor-reactive lymphocytes capable of recognizing and eliminating tumors in a non-MHC-restricted fashion. Previous studies have demonstrated that Ag-specific engagement of chimeric scFv receptors comprising the FcεRI-γ or TCR-ζ signaling moieties was sufficient to stimulate T cell cytokine production, proliferation, and lysis of tumor targets both in vitro and in vivo (8, 9, 10, 11, 12, 13, 14). Direct comparison of γ- and ζ-containing receptors have shown that T lymphocytes expressing the scFv-ζ chimera were more effective in controlling the growth of colon carcinoma in vivo (15); however, despite these encouraging results, T cells expressing the scFv-ζ receptor demonstrated only limited efficacy against established tumors in vivo. One reason to account for these observations is that previous receptor designs have not provided T cells with both primary and costimulatory signals required for optimal activation (16). Given that most nonhemopoietic cancers do not express costimulatory ligands (17), activation of receptor-modified T lymphocytes is likely to be severely compromised in vivo, necessitating strategies such as IL-2 coadministration (18). To overcome problems associated with appropriate T cell activation in vivo, scFv receptors have been engineered to provide Ag-specific costimulation to T cells. The CD28 costimulatory molecule possibly provides the most potent comitogenic signal (19, 20, 21). The engagement of CD28, with ligands CD80/CD86 on APCs, has been shown to greatly enhance T cell-mediated antitumor immunity in vivo (22). Thus, a recent and promising advance in adoptive immunotherapy has been the development of a single chimeric scFv receptor containing both the CD28 and ζ or γ signaling moieties. Others have demonstrated in primary mouse and human T lymphocytes that scFv receptors capable of codelivering CD28 activation have a greater capacity to stimulate cytokine production and proliferation upon Ag ligation in vitro (23, 24, 25, 26). However, the therapeutic utility of this approach has not been examined in tumor models in vivo. Given the refractive nature of colon carcinoma to conventional T cell therapies (4, 27), we have investigated the utility of scFv receptors that incorporate CD28 costimulatory signals to treat carcinoembryonic Ag (CEA)-overexpressing colon cancer. In this study, the therapeutic efficacy of primary mouse T lymphocytes expressing scFv-α-CEA receptors containing the -CD28-ζ, -ζ, or -CD28 signaling domains was evaluated in a syngeneic mouse tumor model. We describe a significant advance to adoptive immunotherapy by demonstrating that T cells activated by a scFv-α-CEA-CD28-ζ chimera have an enhanced capacity to control the growth of established syngeneic tumors, through a mechanism that requires both perforin (pfp) and IFN-γ. The human colorectal carcinoma cell lines COLO 205, mouse (C57BL/6 (B6)) colon adenocarcinoma MC-38 and its CEA transfectant MC-38-CEA2, and the B6 sarcoma cell line 24JK (kindly provided by Dr. P. Hwu, National Institutes of Health, Bethesda, MD) were maintained in RPMI 1640 or DMEM at 37°C and 5% CO2 supplemented with the following additives: 10% (v/v) FCS, 2 mM glutamine, 100 U/ml penicillin, and 100 μg/ml streptomycin (Life Technologies, Grand Island, NY). All tumor cell lines used in this study did not express the CD80 and CD86 costimulatory ligands as determined by flow cytometry. The retroviral packaging cell lines GP+E86 and PA317 and the fibroblast cell line NIH3T3 were cultured in DMEM with additives. GP+E86 cells transduced with recombinant retroviral DNA were maintained in DMEM supplemented with 0.5 mg/ml G418 (Life Technologies). Transduced T cells were cultured in DMEM containing 100 U/ml human rIL-2 (kindly provided by Chiron, Emeryville, CA). Inbred B6, BALB/c, and BALB/c scid/scid (SCID) mice were purchased from The Walter and Eliza Hall Institute of Medical Research (Melbourne, Australia). B6 pfp-deficient (B6 pfp−/−), B6 IFN-γ-deficient (B6 IFN-γ−/−), and B6 IFN-γ−/−pfp−/− mice were bred at the Peter MacCallum Cancer Institute. Mice of 6–12 wk of age were used in all experiments that were performed according to animal experimental ethics committee guidelines. A 767-bp fragment of DNA coding for scFv of anti-CEA and a marker epitope from c-myc were amplified by PCR from the MFE-23 vector (28) and subcloned into XbaI/BstEII-digested pRSVscFvγR (a kind gift from Z. Eshhar, Weizmann Institute, Rehovot, Israel). The chimeric gene constructs were composed of the scFv-anti-CEA mAb, a membrane proximal hinge region of human CD8, and one of the transmembrane and cytoplasmic regions of the human TCR-ζ chain (scFv-anti-CEA-ζ), the transmembrane and cytoplasmic regions of the mouse CD28 signaling chain (scFv-anti-CEA-CD28), or the transmembrane and cytoplasmic regions of the mouse CD28 signaling chain fused to the cytoplasmic region of TCR-ζ (scFv-anti-CEA-CD28-ζ) (Fig. 1⇓A). For detection purposes, each receptor contained a c-myc tag epitope at the C terminus of the VL region. The scFv anti-CEA chimeric receptors were digested with SnaB1/XhoI and subcloned into the HpaI/XhoI restriction sites of the retroviral vector pLXSN (a kind gift from D. Miller, Fred Hutchinson Cancer Research Center, Seattle, WA) containing the long terminal repeat and a neomycin resistance gene under the control of an SV40 promoter. Expression of the chimeric scFv-anti-CEA-CD28-ζ, -CD28, and -ζ receptors in mouse T lymphocytes. A, Schematic representation of the scFv-anti-CEA-CD28-ζ, -CD28, and -ζ receptors. Each construct was composed of the VH and VL regions of the anti-CEA mAb joined by a flexible linker, a membrane-proximal hinge region of human CD8α and the transmembrane (TM) and cytoplasmic regions of the human TCR-ζ chain, mouse CD28 signaling chain, or CD28 fused to the intracellular domain of ζ. A c-myc tag epitope was incorporated into the C terminus of the VL region for expression analysis. Expression of the scFv-anti-CEA-CD28-ζ (B), -CD28 (C), and -ζ (D) chimeric receptors or pLXSN retrovirus (E) in primary mouse T lymphocytes was analyzed by flow cytometry. Cells were stained with an anti-tag mAb (solid line) or an IgG1 isotype control mAb (dashed line). Ag-specific cytotoxicity of scFv-ζ-, -CD28-, and -CD28-ζ-transduced T cells was evaluated in 6-h 51Cr release assays. Enriched splenic B6 T cells transduced with the scFv-CD28-ζ (open circles) or scFv-ζ (filled circles) chimeras equivalently lysed the CEA+ tumors, COLO 205 (F) and MC-38-CEA2 (H), but not the CEA− tumors, 24JK (G) and MC-38 (I). T cells transduced with the CEA-CD28 chimeric receptor (open triangles) or pLXSN retrovirus alone (open squares) were unable to lyse the CEA−/+ tumor cells. The spontaneous lysis was <10% in all assays. Results are expressed as percent specific 51Cr release ± SE of triplicate samples and are representative of at least two experiments. Stable GP+E86 ecotropic packaging cell lines expressing the scFv-anti-CEA-ζ, -CD28, or -CD28-ζ receptors were isolated as described previously (13, 15). GP+E86 clones producing ∼107 CFU/ml were used for transduction of mouse spleen T lymphocytes. Spleen cells from mice were initially depleted of RBCs by hypotonic lysis with NH4Cl and enriched by passing through a nylon wool syringe as described previously (13, 15). Enriched T lymphocytes (107) were then cocultivated for 72 h with 5 × 105 viral-producing packaging cells in DMEM supplemented with 4 μg/ml polybrene, 5 μg/ml PHA (Sigma-Aldrich, St. Louis, MO), and 100 U/ml rIL-2. After cocultivation, T cells were separated from adherent packaging cells, washed with DMEM, and cultured in DMEM supplemented with 100 U/ml rIL-2. T cells were subsequently analyzed for transduction efficiency by flow cytometry and used for in vitro and in vivo experiments. Detection of cell surface chimeric receptor expression on mouse T lymphocytes was achieved by indirect immunofluorescence with a c-myc tag Ab purified from supernatants of mouse 9E10 cells (29), followed by staining with a PE-labeled anti-mouse Ig mAb (BD Biosciences, San Jose, CA). Background fluorescence was assessed using a purified IgG isotope Ab (3S193, Ludwig Institute for Cancer Research, Melbourne, Australia). Cell surface phenotyping of transduced cells was determined by direct staining with Quantum-Red-labeled anti-TCRαβ (clone H57–597; BD PharMingen, San Diego, CA), FITC anti-CD4 (H129.19; Sigma-Aldrich), and Quantum-Red-labeled anti-CD8 (R-3762; Sigma-Aldrich) mAbs as previously described (13). Cell surface phenotyping of tumor cell lines was determined by indirect immunofluorescence with anti-human CEA (I-1; Ref. 30), anti-mouse or -human CD80 (mouse, 1G10; human, BB1; Sigma-Aldrich), and CD86 (mouse, GL1; human, 2331(FUN-1); Sigma-Aldrich) mAb, followed by staining with a fluorophore-labeled anti-Ig mAb. As previously described, T cell populations were ≥85% CD8+ (13, 15). The binding capacity of gene-modified mouse T lymphocytes was determined in a rosetting assay as described (13). The cytolytic capacity of transduced T cells was determined in a 6-h 51Cr-release assay. Briefly, receptor-modified and mock-transduced T cells from BALB/c or B6 mice were cocultured in a round-bottom microtiter plate with sodium [51Cr]chromate-loaded CEA+ (COLO 205 and MC-38-CEA2) or CEA− (24JK and MC-38) tumor cells. Cytotoxicity was expressed as the percentage specific 51Cr release after subtraction of spontaneous release of 51Cr, which was 5–10% of the total release. The spontaneous release of 51Cr was determined by incubating the target cells with medium alone. Maximum release was determined by adding SDS to the final concentration of 5%. The percentage specific lysis was calculated as follows: 100 × [(experimental release − spontaneous release)/(maximum release − spontaneous release)]. All determinants were performed at least twice in triplicate. Three different adoptive transfer models were used. First, 106 mouse 24JK sarcoma cells and/or 5 × 106 human COLO 205 colon carcinoma cells were injected s.c. into opposite flanks of groups of 10 SCID mice. Spleen T lymphocytes from BALB/c mice (5 × 106) (transduced with LTR promoter, gene x, SV-40 promoter, and neor gene (LXSN) plus scFv-anti-CEA-ζ, -CD28, -CD28-ζ, or mock-transduced T cells) were injected i.v. into groups of 10 SCID mice at 6 h (day 0) and 24 h (day 1) after tumor inoculation. In a separate experiment, using this SCID mouse model, the antitumor response of transduced BALB/c splenocytes was assessed against 3 × 106 mouse adenocarinoma MC-38 and/or MC-38-CEA2 tumor cells injected s.c. into opposite flanks of groups of 10 SCID mice. In the second model, 3 × 106 mouse MC-38 and/or MC-38-CEA2 tumor cells were injected s.c. into opposite flanks of groups of 10 B6 mice. Spleen T lymphocytes (5 × 106) from B6 mice (transduced with LXSN plus scFv-anti-CEA-ζ, -CD28, -CD28-ζ, or mock-transduced T cells) were injected i.v. into groups of 10 SCID mice at 6 h (day 0) and 24 h (day 1) or 107 at day 3 after tumor inoculation. 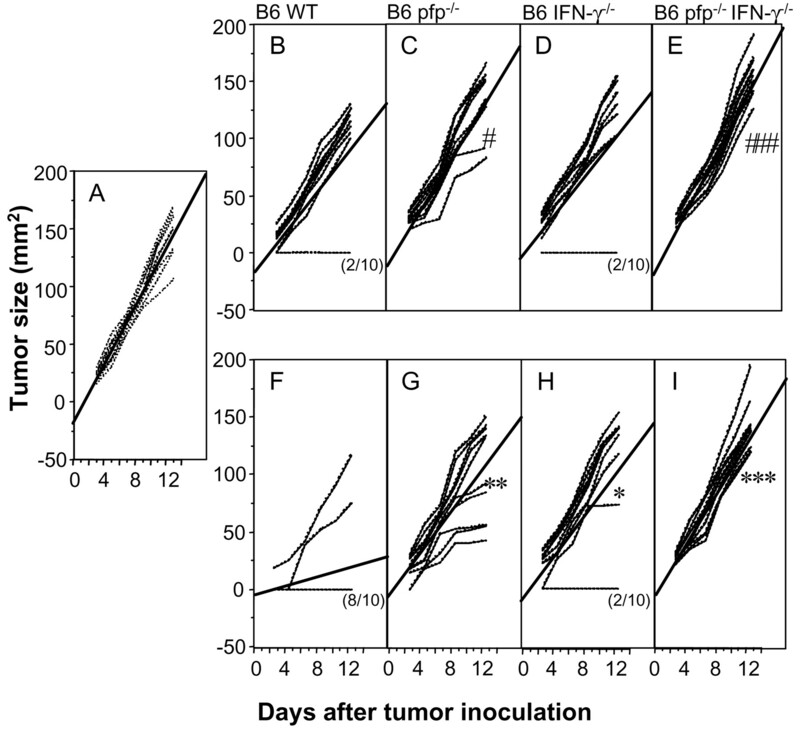 In addition, adoptive transfer of scFv-transduced spleen T lymphocytes (5 × 106; days 0 and 1) from B6 pfp−/−, B6 IFN-γ−/−, or B6 pfp−/−IFN-γ−/− mice was used to evaluate involvement of pfp and IFN-γ. Subsequent tumor growth was monitored daily and measured by a caliper square along the perpendicular axes of the tumors. The data were recorded as the mean tumor size (mm2; product of the two perpendicular diameters) ± SEM. In the third model, 3 × 106 mouse MC-38-CEA2 tumor cells were injected i.p. into groups of 10 B6 mice. Spleen T lymphocytes (5 × 104–5 × 105) from B6 mice (transduced with LXSN plus scFv-anti-CEA-ζ, -CD28, -CD28-ζ, or mock-transduced T cells) were injected i.p. into B6 mice at 6 h (day 0) and 24 h (day 1) after tumor inoculation. Mice were monitored daily for tumor ascites development, indicated by swelling of the abdomen, and were culled when obvious signs of tumor growth were noted. We generated several chimeric receptor gene constructs composed of the scFv (VH and VL) regions of the anti-CEA mAb linked via a CD8α hinge to the transmembrane and cytoplasmic regions of TCR-ζ, CD28, or CD28 fused to the intracellular domain of ζ (Fig. 1⇑A). The incorporation of the ζ intracellular sequence distal to CD28 was required for effective functional expression of the scFv-CD28-ζ receptor, as previously demonstrated (23, 26). Surface expression of the scFv-α-CEA receptors in transduced CD8+ primary splenocytes was determined by flow cytometry using an anti-c-myc tag mAb directed at the tag epitope located within the extracellular domain of these receptors (Fig. 1⇑, B–E). Consistent and equivalent levels of expression of the scFv-CD28-ζ, -CD28, and -ζ chimeric receptors were reproducibly detected on T cells (n = 5). The cytolytic capacities of T cells expressing the scFv-α-CEA-CD28-ζ (T-scFv-CD28-ζ), scFv-α-CEA-CD28 (T-scFv-CD28), or scFv-α-CEA-ζ (T-scFv-ζ) receptors were evaluated against CEA+CD80−CD86− tumor cells in standard 6-h 51Cr release assays. T-scFv-CD28-ζ and T-scFv-ζ cells demonstrated an equivalent ability to specifically conjugate to (binding assays; data not shown) and lyse the CEA+ human COLO 205 colon carcinoma and mouse MC-38-CEA2 colon adenocarcinoma cell lines (Fig. 1⇑, F and H). Equivalent levels of cytolysis were also mediated by both transduced T cell effector populations after 16 h (data not shown). Lysis of the CEA− mouse 24JK sarcoma and mouse MC-38 cell lines was not detected, demonstrating the Ag specificity of cytolysis (Fig. 1⇑, G and I). T-scFv-CD28 cells were unable to lyse any of the tumor cell lines tested. These data indicated that the scFv-CD28-ζ chimera was functional and that fusion of the CD28 and ζ cytoplasmic domains neither enhanced nor diminished the cytolytic function. Previous studies have demonstrated greatly enhanced capacity of T-scFv-CD28-ζ cells to secrete Tc1 cytokines upon Ag ligation in vitro (23, 24, 25, 26); however, our in vitro studies indicated only modest enhancement of proliferation and cytokine secretion by T cells engineered with the scFv-αCEA-CD28-ζ chimera in response to CEA-expressing tumor targets (data not shown). Previous studies have not tested the ability of T-scFv-CD28-ζ cells to reject tumor in vivo. Thus, the capacity of the scFv-CD28-ζ, -CD28, and -ζ chimeric receptors to stimulate T cell antitumor function against CEA+CD80−CD86− tumor targets was evaluated in adoptive transfer assays using SCID mice. Transduced T-scFv-CD28-ζ, -CD28, and -ζ cells (5 × 106) were injected i.v. into SCID mice 6 h (day 0) and 24 h (day 1) after s.c. inoculation of CEA+ COLO 205 or MC-38-CEA2 tumor in the right flank and CEA−24JK or MC-38 tumor in the left flank. As previously demonstrated (15), T cells expressing the scFv-ζ chimera were capable of mediating Ag-specific antitumor responses against the COLO 205 (5 of 10 eradications) and MC-38-CEA2 (3 of 10 eradications) tumor targets (Fig. 2⇓, A and C). However, T-scFv-CD28-ζ cells were shown to mediate a more effective antitumor response, with the complete eradication of 7 of 10 COLO 205 and MC-38-CEA2 tumors (Fig. 2⇓, A and C), and increased ability to control the growth of escaping tumors. However, more striking was the effect of T-scFv-CD28-ζ cells, which stimulated a more effective antitumor response with the complete eradication of 7 of 10 COLO 205 and MC-38-CEA2 tumors (Fig. 2⇓, A and C). The antigenic specificity of both the scFv-ζ and CD28-ζ chimeras was demonstrated by the lack of antitumor activity against the CEA− tumors growing in the opposite flank of these mice (Fig. 2⇓, B and D). Ligation of the scFv-CD28 chimera did not elicit a T cell antitumor response against either CEA-negative or -positive tumors (Fig. 2⇓). Mice with tumors eradicated by T cell treatment were monitored for between 50 and 100 days after tumor inoculation, and all remained tumor free. Enhanced efficacy of scFv-anti-CEA-CD28-ζ-transduced T cells in rejecting colon carcinomas in SCID mice. A, Growth of the CEA+ human COLO 205 colon carcinoma cells (5 × 106) (right flank) and CEA− 24JK mouse sarcoma cells (106) (left flank) (B) or 3 × 106 CEA+ mouse MC-38-CEA2 (right flank) (C) and CEA− MC-38 (left flank) (D) adenocarcinoma cells injected s.c. into groups of 10 SCID mice. Mice were injected i.v. with two doses of 5 × 106 BALB/c T cells transduced with the pLXSN vector alone (open squares), scFv-CD28 chimera (open triangles), scFv-ζ chimera (filled circles), or scFv-CD28-ζ chimera (open circles) on days 0 and 1 after tumor inoculation. Growth of the CEA+ and CEA− tumors in mice receiving no T cell transfer was also monitored (filled squares). For all experiments, results are represented as the mean tumor size (mm2) ± SEM. Arrows depict the days of T cell transfer, and the number of tumor eradications is shown in parentheses. Tumor growth inhibition of T-scFv-CD28-ζ and T-scFv-ζ cells was statistically compared by Mann-Whitney U test; ∗, p ≤ 0.05. We next compared the specificity and antitumor potency of T-scFv-ζ and T-scFv-CD28-ζ cells against i.p. or s.c. MC-38-CEA2 tumors in syngeneic B6 mice. In the first model, the i.p transfer of two doses of 5 × 105 (106 total) T-scFv-CD28-ζ cells, 6 h and 24 h after i.p. 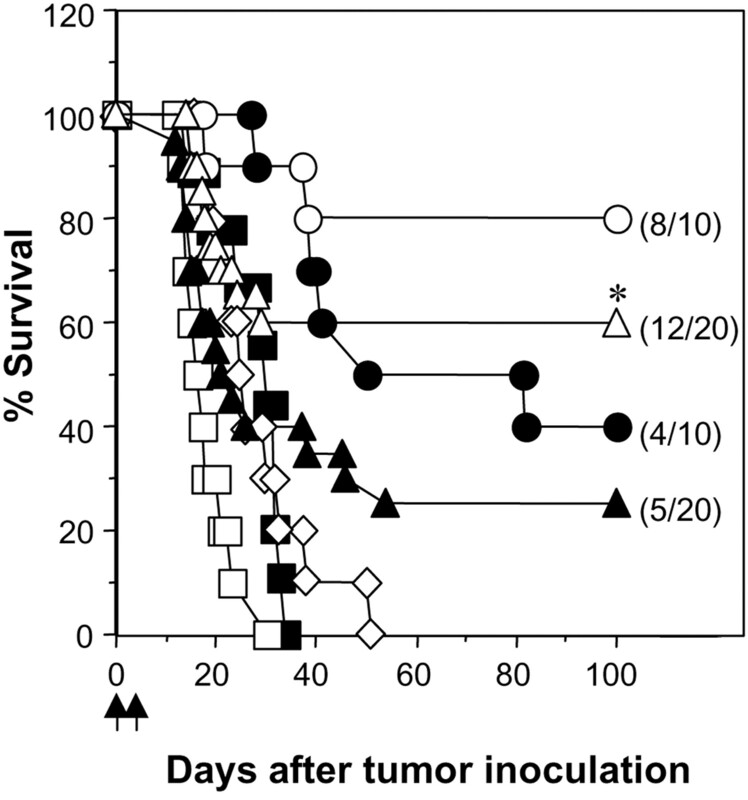 inoculation of MC-38-CEA2 tumor, resulted in 80% survival (8 of 10 mice; Fig. 3⇓). In contrast, i.p. transfer of 106 T-scFv-ζ cells (5 × 105; days 0 and 1) resulted in 40% survival (4 of 10 mice; Fig. 3⇓). Strikingly, T-scFv-CD28-ζ cells were significantly more potent than T-scFv-ζ cells in controlling the growth of MC-38-CEA2 tumors, in that the adoptive transfer of 105 (5 × 104; days 0 and 1) T-scFv-CD28-ζ cells resulted in 60% survival of mice (12 of 20 mice), compared with 25% survival for T-scFv-ζ cells (5 of 20; p ≤ 0.05; Fig. 3⇓). Both T-scFv-CD28-ζ and T-scFv-ζ cells had no effect on the i.p. growth of CEA− MC-38 tumors (data not shown), and T-scFv-CD28 cells did not elicit an antitumor response against the i.p growth of MC-38-CEA2 tumors (Fig. 3⇓). Superior antitumor response by scFv-anti-CEA-CD28-ζtransduced T cells against i.p. syngeneic colon adenocarcinoma. The survival of groups of 10–20 B6 mice inoculated i.p. with 3 × 106 MC-38-CEA2 tumor cells. Mice were injected i.p. with two doses of 5 × 105 B6 T cells transduced with the pLXSN vector alone (open squares), scFv-CD28 chimera (open diamonds), scFv-ζ chimera (filled circles), or scFv-CD28-ζ chimera (open circles) or with two doses of 5 × 104 B6 T cells transduced with the scFv-ζ chimera (filled triangles) or scFv-CD28-ζ chimera (open triangles) on days 0 and 1 after tumor inoculation. Survival of mice receiving no T cell treatment was also monitored (closed squares). Results are represented as the percentage of survival, and arrows depict the days of T cell transfer. Tumor-free mice treated with the same dose of T cells were compared and statistically evaluated by Fisher’s exact test; ∗, p ≤ 0.05. In the second and more stringent model, transduced T cells were adoptively transferred i.v. into B6 mice 6 h (day 0) and 24 h (day 1) after s.c. inoculation of mice with CEA+ MC-38-CEA2 tumor in the right flank and CEA− MC-38 tumor in the left flank. As was observed in the xenogeneic SCID mouse model, T-scFv-ζ cells were capable of significantly inhibiting the growth of CEA+ tumors (5 of 10 eradications; Fig. 4⇓A). Although i.v. transfer of T-scFv-CD28-ζ cells eradicated only 6 of 10 MC-38-CEA2 tumors, these effector T cells were far more effective at controlling the growth of tumors that had escaped rejection, similar to what was observed in the xenogenic SCID model (Fig. 4⇓A). The antigenic specificity of both the scFv-ζ and scFv-CD28-ζ chimeras was demonstrated by the lack of antitumor activity against CEA− tumors growing in the opposite flank of these mice (Fig. 4⇓B). Given the effectiveness of early treatment of mouse colon adenocarcinoma with T-scFv-CD28-ζ cells, we next compared the antitumor efficacy of a single dose (107) of T cells against 3-day established CEA+ MC-38-CEA2 tumors (mean size, ∼10 mm2). Although no complete tumor eradications were observed, the T-scFv-CD28-ζ cells mediated statistically greater growth inhibition of MC-38-CEA2 tumors compared with T-scFv-ζ cells, which had minimal antitumor effect on these rapidly growing tumors (p ≤ 0.01; Fig. 4⇓C). Treatment of mouse colon adenocarcinoma with T-scFv-CD28 cells had no effect on the s.c. growth of CEA-negative and -positive MC-38 tumors. Optimal growth inhibition of s.c. syngeneic colon adenocarcinoma by scFv-anti-CEA-CD28-ζ-transduced T cells. Growth of CEA+ mouse colon adenocarinoma cells, MC-38-CEA2 (3 × 106) (right flank) (A) and CEA− MC-38 parental cells (106) (left flank) (B) injected s.c. in groups of 10 B6 mice. Mice were injected i.v. with two doses of 5 × 106 B6 T cells transduced with the pLXSN vector alone (open squares), scFv-CD28 chimera (open triangles), scFv-ζ chimera (filled circles), or scFv-CD28-ζ chimera (open circles) on days 0 and 1 after tumor inoculation. Growth of the CEA+ and CEA− tumors in mice receiving no T cell transfer were also monitored (filled squares). C, Growth inhibition of 3-day established MC-38-CEA2 tumor injected s.c. into groups of 10 B6 mice. Mice were injected i.v. with a single dose (107) of B6 T cells transduced with the pLXSN vector alone (open squares), scFv-CD28 chimera (open triangles), scFv-ζ chimera (open circles), or scFv-CD28-ζ chimera (filled circles) on day 3 after tumor inoculation. Growth of MC-38-CEA2 tumors in mice receiving no T cell transfer was also monitored (filled squares). For all experiments, results are represented as the mean tumor size (mm2) ± SEM. Arrows depict the days of T cell transfer, and the number of tumors eradicated is shown in parentheses. Tumor growth inhibition of T-scFv-CD28-ζ and T-scFv-ζ cells was statistically compared by Mann-Whitney U test; ∗, p ≤ 0.01. We next wanted to determine the underlying mechanism(s) influencing the potent antitumor activity of T-scFv-CD28-ζ cells in vivo. T cells from B6 wild-type (WT), IFN-γ−/−, pfp−/−, and pfp−/−IFN-γ−/− mice were transduced with the scFv-ζ or scFv-CD28-ζ chimeric receptors and injected i.v. into B6 mice 6 h and 24 h after their s.c. inoculation with MC-38-CEA2 tumor. Individual MC-38-CEA2 tumors grew rapidly in all untreated mice (Fig. 5⇓A). As demonstrated previously, WT T-scFv-ζ cells were somewhat effective and eradicated 2 of 10 tumors (Fig. 5⇓B); however, strikingly WT T-scFv-CD28-ζ cells were far more effective, eradicating 8 of 10 MC-38-CEA2 tumors. Perforin was particularly important for effective tumor rejection, because pfp−/− T-scFv-ζ and T-scFv-CD28-ζ cells did not eradicate any tumors (Fig. 5⇓, C and G). Interestingly, IFN-γ−/− T-scFv-CD28-ζ cells were significantly less effective (2 of 10 tumors eradicated) than WT T-scFv-CD28-ζ cells (8 of 10 eradications) at inhibiting the growth of the CEA+ MC-38-CEA2 tumors (p ≤ 0.005), suggesting that enhanced IFN-γ production was critical for the superior antitumor response mediated by T-scFv-CD28-ζ cells in vivo (Fig. 5⇓, D and H). Together, pfp and IFN-γ accounted for the antitumor activity of both transduced T cell effector populations, in that MC-38-CEA2 tumor growth was unaffected in mice, which received gene-modified T cells from pfp−/−IFN-γ−/− mice (Fig. 5⇓, E and I). Similar results were also obtained with the transfer of scFv receptor-modified BALB/c-WT, IFN-γ−/−, pfp−/−, and IFN-γ−/−pfp−/− T cells into SCID mice bearing human COLO 205 s.c. tumors (data not shown), indicating that both pfp and IFN-γ are important general antitumor effector pathways used by T-scFv-CD28-ζ cells. IFN-γ- and pfp-dependent inhibition of syngeneic colon adenocarcinomas by scFv-CD28-ζ-transduced T cells. A, Subcutaneous growth of individual CEA+ mouse MC-38-CEA2 cells in 10 untreated B6 mice. B–I, Growth of individual CEA+ mouse MC-38-CEA2 cells (3 × 106) injected s.c. into groups of 10 B6 mice. Mice were injected i.v. with two doses (5 × 106) of T cells from B6-WT, pfp−/−, IFN-γ−/−, and pfp−/−IFN-γ−/− mice transduced with the scFv-anti-CEA-ζ (B–E) or scFv-anti-CEA-CD28-ζ (F–I) receptors on days 0 and 1 after tumor inoculation. 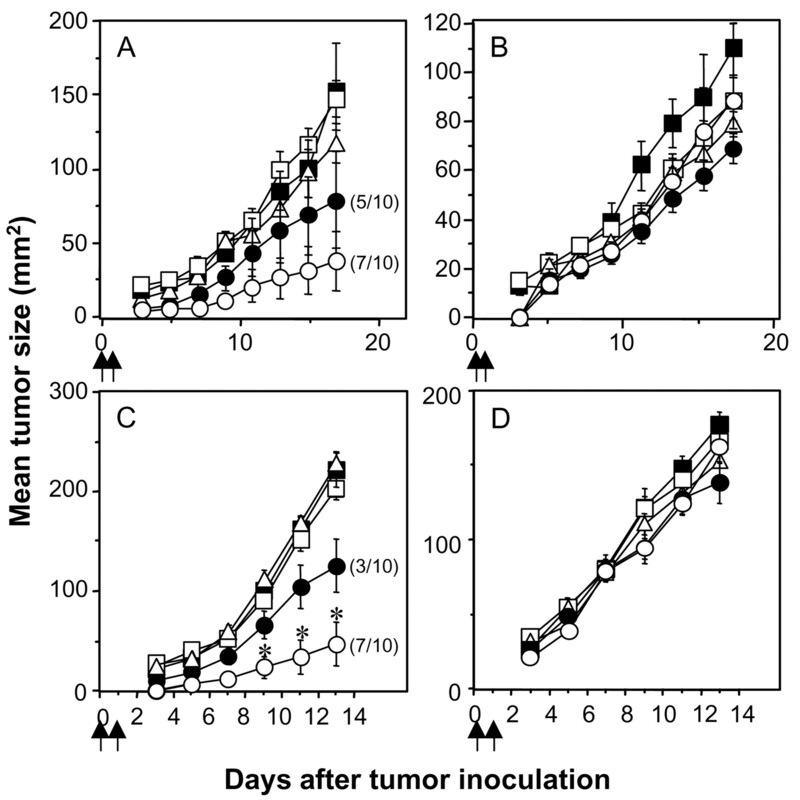 Individual tumor growth curves for each mouse are depicted by dashed lines, and the mean growth rate (mm2) for each group is represented by the solid line. The number of tumors eradicated is shown in parentheses. Tumor growth inhibition mediated by T-scFv-CD28-ζ or T-scFv-ζ, pfp−/−, IFN-γ−/−, and pfp−/−IFN- γ−/− cells were compared with the equivalent WT T cell populations and statistically analyzed by Mann-Whitney U test; T-scFv-CD28-ζ: ∗, p <0.005; ∗∗, p ≤ 0.001; ∗∗∗, p < 0.0001; T-scFv-ζ: #, p ≤ 0.01; ###, p < 0.0001. To address the problem of tumor escape, which includes down-regulation of MHC/peptide molecules and/or costimulatory ligands (1, 17), we have gene-engineered primary T cells with chimeric scFv receptors, which can stimulate both primary and costimulatory signals for optimal T cell activation. In this study, we have significantly advanced the examination of the scFv receptor approach by demonstrating enhanced in vivo function of primary mouse T lymphocytes expressing a scFv-CD28-ζ chimera reactive with the CEA. We have illustrated for the first time the ability of the scFv-CD28-ζ receptor to synergistically harness the costimulatory functions of CD28 and the cytolytic capacity of ζ and to evoke a vigorous T cell-mediated antitumor response against both xenogeneic and syngeneic colon adenocarcinomas in vivo. This work has extended previous studies, which have only demonstrated superior function of the scFv-CD28-ζ receptor in vitro (23, 24, 25, 26). Furthermore, we have also obtained similar data using T-scFv-CD28-ζ cells recognizing the erbB2 tumor-associated Ag (data not shown), demonstrating the potentially broad therapeutic utility of this approach for the treatment of cancer. An important observation from our studies using gene-targeted mice was that the enhanced antitumor efficacy of the scFv-CD28-ζ chimera in vivo was critically dependent on the Ag-specific, CD28-mediated secretion of IFN-γ by gene-engineered T cells. Although a role for pfp in the direct lymphocyte-mediated cytolysis of tumors has been well documented (13, 31), as was the case for T cells expressing either chimeric receptor, the exact role of IFN-γ in T cell-mediated tumor immunity still remains unclear. There are a number of studies suggesting that IFN-γ can mediate its effect directly by enhancing Ag presentation on tumor cells through both MHC class I and II pathways (32, 33), increasing tumor cell susceptibility to apoptosis by up-regulation of Fas expression (33) and/or by inducing cell cycle arrest (34, 35). Interestingly, the comparable efficacy of T-scFv-CD28-ζ cells against both mouse adenocarcinoma, MC-38-CEA2, and human colon carcinoma, COLO 205, in SCID mice suggested that IFN-γ was not having a direct effect on these tumors. In addition to having direct effects, IFN-γ has been shown to have indirect mechanisms of action, including the recruitment and activation of endogenous immune effector cells (36), the regulation of leukocyte-endothelium interactions (36, 37), and/or induction of anti-angiogenesis (38, 39, 40). Although we have demonstrated the key need for T cell IFN-γ secretion, the production of other Tc1 cytokines may also contribute to the antitumor response mediated by the T-scFv-CD28-ζ cells. Additional adoptive transfer assays using WT cells and T cells from other gene-targeted mice will be directed at defining the effector molecules and host cells contributing to the improved efficacy of T-scFv-CD28-ζ cells. Furthermore, the ability of scFv-CD28-ζ chimera to transduce costimulatory signals that can enhance T cell proliferation in vitro (5), even after sequential antigenic restimulation (26), may further account for the superior antitumor efficacy of T-scFv-CD28-ζ cells in vivo. We have not yet tested the proliferative and survival advantage of T cells expressing this scFv-CD28-ζ chimeric receptor in vivo; however, another study has indicated that mouse T cells retrovirally engineered with TCR genes could survive up to 80 days after transfer into SCID mice (41). Although encouraging, it will now be interesting to evaluate these functional parameters in immunocompetent tumor-bearing mice. Similar to chimeric receptors containing the TCR-ζ and FcεRI-γ signaling chains, engagement of a chimera containing the intracellular domain of CD28 has also been shown to transduce costimulatory signals equivalent to those mediated upon ligation of endogenous CD28 receptors (42, 43). Although the ability of CD28 to transduce signals distinct from the TCR remains unresolved, CD28 may influence immediate and sustained TCR signaling by the recruitment of phosphatidylinositol-3-kinase and tyrosine kinase Itk and activation of Src family kinases such as Lck, mediated by different motifs within the cytoplasmic tail (44, 45, 46, 47). Furthermore, recent studies have also identified specific adapter molecules such as VAV/SLP-76 within the CD28 signaling pathway that may play a role in regulating cytokine gene transcription (48). It will now be interesting to evaluate whether the fusion of the CD28 and ζ signaling molecules in the one chimera can mimic the synergistic signaling activities of endogenous TCR and CD28 or provide alternative signaling pathways. Given the independent potency of T cell signaling subunits and the modular design of chimeric receptors, there is further scope to engineer chimeras with varying signaling potency and function. The incorporation of the Src kinase Lck into chimeras containing ζ or CD28-ζ signaling domains was shown to stimulate enhanced T cell activity compared with a receptor containing only the ζ chain (23). Furthermore, a chimeric receptor containing the cytosolic protein tyrosine kinase Syk was also shown to be capable of stimulating T cells to produce cytokines and lyse target cells expressing an appropriate Ag in vitro (49). Incorporation of kinase activity may prove useful in redirecting the specificity of T cells with impaired downstream TCR signaling, such as those in cancer-bearing hosts (50). Overall, this study has demonstrated the therapeutic value of providing T cells with primary and costimulatory signals using a single scFv chimeric receptor that recognizes a tumor-associated Ag in vivo. This approach to deliver costimulation to T cells avoids the problems associated with having to coexpress two chimeras in primary T lymphocytes. Unlike bispecific mAbs, which can rapidly dissociate from the T cell surface, the stable surface expression of scFv-CD28-ζ chimeric receptors can serve to increase the strength and time of interaction between T cells and tumor cells, thereby enhancing T cell responsiveness. Importantly, in terms of clinical application, T-scFv-CD28-ζ cells eliminated tumors in the absence of exogenous IL-2 administration and, given that similarly transduced human T cells produce IL-2 (24), this approach may eliminate IL-2 toxicity associated with other adoptive immunotherapies using lymphokine-activated killer cells and tumor-infiltrating lymphocytes (27). In addition, given the non-MHC-restricted reactivity of scFv receptors, this approach would not be affected by tumor loss of MHC/peptide molecules, which could severely compromise approaches redirecting T cell specificity using only TCR genes. Ultimately, these scFv-CD28-ζ chimeric receptors must now be humanized and expressed in human primary T lymphocytes, and their antitumor efficacy must be evaluated in tumor-bearing SCID mice. This optimized chimeric receptor design will have a significant impact on the overall utility of passive T cell-based immunotherapy for the treatment of cancers, which have proven resistant to common treatment regimes. We thank the staff of the Peter MacCallum Cancer Institute animal facilities for the caring and maintenance of mice used in this study. ↵1 This work was supported by a program grant from the Susan G. Komen Breast Cancer Foundation and a project grant from the Anti-Cancer Council of Victoria. M.J.S. and J.A.T. are currently supported by National Health and Medical Research Council of Australia Principal Research Fellowships. ↵2 M.J.S. and P.K.D. contributed equally to this work. ↵4 Abbreviations used in this paper: scFv, single-chain variable fragment of Ig; CEA, carcinoembryonic Ag; pfp, perforin; LXSN, LTR promoter, gene x, SV-40 promoter, and neor gene; WT, wild type.